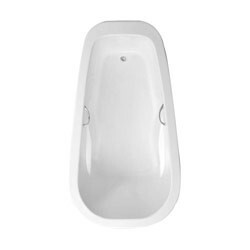 The Reo 7242 oval tub has a spacious organic design, clean lines, and intuitive function that will turn any bathroom into one's personal spa. Featuring a deep bathing well with integral armrests, one pillow and decorative handles. Available as a soaking tub, air tub whirlpool tub. Call 800-720-1062 for more details. 42" x 72" x 24"